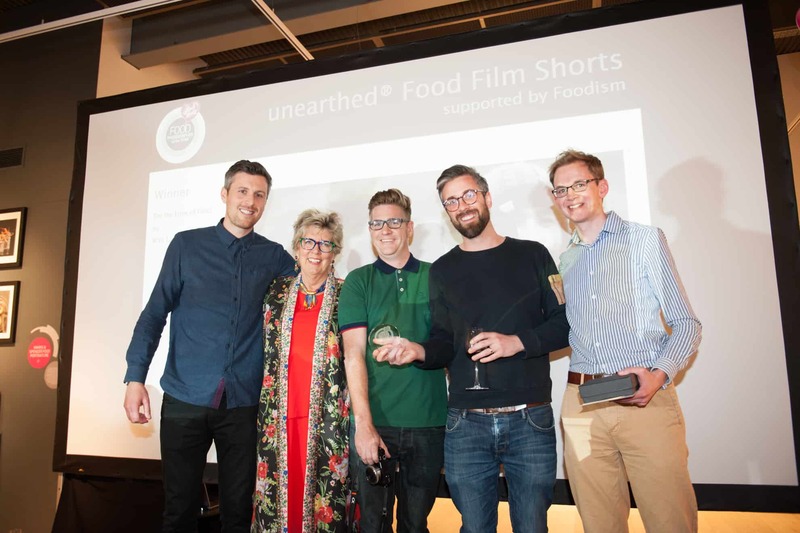 In 2018, a stunning film short, For the Love of Food, about cooking and food producing on the Isle of Skye, filmed by With Love Project, seized the crown in the unearthed® Food Film Shorts category supported by Foodism. Rob Evans, Matt Roberts and Chris Roberts were presented with their £1000 prize by Simon Day, Founder, unearthed®, sponsor of the category. Today we have invited them to talk on our blog to tell us a bit more about themselves, the project and what was involved in their winning film. Chris - My background is in brand design and art direction and have worked in the creative industries for over 15 years. I’m passionate about storytelling and working with interesting brands that are doing great things. Rob - My background is in photography and film and I have worked across many sectors, from fashion and portraiture to animation and TV. What I am most passionate about is photographing people, of capturing their personality and telling their story within a single frame. Matt - I’m a writer/director based in London. I started in theatre as co-founder and artistic director of Papatango an award-winning new writing company. Then around eight years ago I started on my journey with film. I’ve made a bunch of short films that have played in some of the world’s biggest festivals including Palm Spring and been nominated for British Comedy Awards. We started working together on the With Love Project in 2016. It started as a personal project with a plan was to visit 5 British fashion producers, photograph and interview them, then celebrate their stories in a small printed marketing piece. Over 70 visits, 2 hardback books and 2 short films later the project has become a business in its own right. Chris - A few years ago I started producing brand films for companies and products and our first With Love Film “The backbone of Britain” was back in 2016 when we travelled the length of the country and documented the crafts people we met. Rob - My first job after uni was as a lighting camera assistant for an animation studio called Cosgrove Hall Films working on stop frame animation, since then I have mainly worked in stills photography however collaborating on the With Love Project has given me a new-found love of documentary making. Matt - I been a freelance film maker for around eight years. Then three years ago I took the plunge and set up my own production company Truck Films. We’ve grown year on year and I get to work with some amazing people (like the With Love boys). How did the film ‘For the Love of Food’ come about? The idea for our short film came about while collecting stories for our 2nd book, ‘For the Love of Food’, we were traveling the country visiting British artisan food producers. We wanted to make a short film to help promote this book but also something that would stand up as a short film on its own, for this reason we turned to Matt Roberts (Chris’s brother) from truck films who we knew would be the perfect partner for this project. We decided to bring a crew with us on a visit to Skye and anchor the film with Michelin star chef Michael Smith who talked about his belief in the importance of local food, of producing things properly and doing it with love. We had a great selection of producers to visit for the book and then when Michael came on board it was a no-brainer. We wanted to capture the skills of producing amazing dishes from fantastic ingredients. The idea was the easy bit. Because we filmed it on a shoestring we only had 3 days to shoot the whole thing. We crammed in three producer visits which included shooting in a blizzard, squeezing onto a rubber dingy, crashing a drone, four interviews and one special dish. It was fast, but it was fun. Time. As with any creative project you always want more time to prep, to recce, to spend with each person and to check what you’ve shot. Thankfully this time it all came together, and we managed to get everything we needed to really capture the passion that goes into producing great produce and amazing tasting food. Chris - Pen and pad, I’m constantly jotting things down and ticking things off. Rob - My trusty VW Transporter which has taken us around the UK several times over. Matt - My laptop. Nearly every other gadget changes depending on the job. Your top 3 tips for making a film on the theme of food? 2. Have lots of versions of the same dish - Definitely needed to get plenty of takes in order to capture the perfect visuals. 3. Recce - It’s always important to understand and get a feel for where you are shooting.